Music is and has been a major part of life on earth, and it is not just birds and whales that sing. It has been proposed that humans already sang before we developed language, and that music is closely linked to social contact between humans. Music is typically experienced in groups, part of our evolution since a wide range of cultures invented instruments and songs, and even rooted in our biology (1). But what if music and life share an even deeper basis? What if music and DNA, the basis of life on earth, share a common principal? And consequently, what would it sound like if DNA and the coded proteins could be translated into music? Kenshi Hayashi and Nobuo Munakata, two of the first scientists since the discovery of DNA asked and answered the question what DNA sequences could sound like. During the 80s when no computer-assisted analyses tools for DNA sequence analysis existed yet, the two scientists from Tokyo, Japan thought about a way to simplify and facilitate the tedious endeavour of handling DNA sequences. They assigned solmization syllables to the four nucleotides that constitute DNA: “re” for guanine (G), “mi” for cysteine (C), “sol” for thymine (T) and “la” for adenine (A), as well as additional further specifications for G and C- and A and T-rich regions (2) to create the first DNA-based music. Munakata refined this system and later released electronic songs based on nucleotide and amino acid sequences on this web page (www.toshima.ne.jp/~edogiku/index.html). Some of the songs are melodic, such as the “Catalog of Restriction Enzyme” (enzymes that cut DNA strands), while others such as “Coupling Made Easy by RecA-DNA Complex” sound a bit chaotic. The evolutionary biologist Susumu Ohno attended to the question if there is a common principal to music and DNA. He proposed that the principle of recurrence is the basis for both music and coding DNA sequences. He argued that in the light of evolutionary theory, primordial nucleotide sequences in the form of oligomers existed initially and that genomes evolved from these. Ultimately, genomes as a whole are based on repetition of genes whose coding sequences consist of truncated, extended and base-substituted variances of these primordial oligomers (bases are the differentiating parts of nucleotides). Similarly, music is also based on recurrences of different tones and sound sequences. 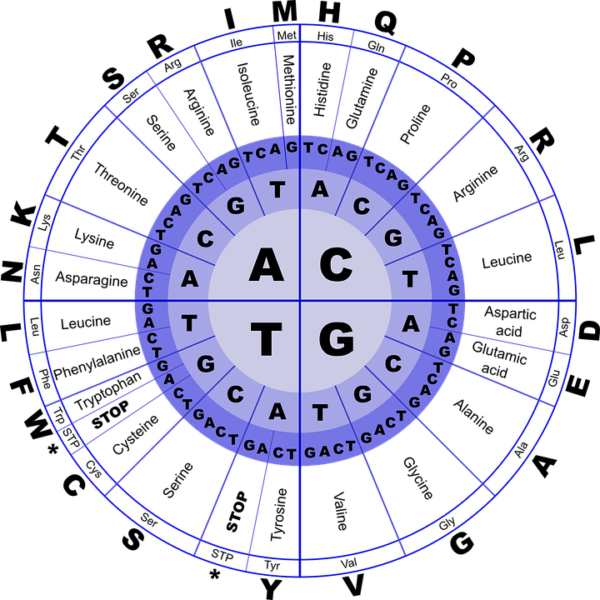 Ohno developed an elaborate system to translate DNA sequences into music by assigning two consecutive positions in the octave scale to each nucleotide. This assignment was based on the molecular weight of the nucleotides: A and G as purines occupy the lower end of the octave scale, while C and T as pyrimidines occupy the upper end. The big surprise came when Ohno reversed this process and translated Chopin Nocturne Op. 55, No. 1 into a sequence of 160 nucleotides. This sequence very closely resembled a part of the open reading frame (ORF – a DNA sequence that encodes a protein) of a specific enzyme in mice that is involved in the expression of proteins based on DNA (the last exon of the large subunit of the RNA polymerase II) (3-5). Ohno continued his work in this field and translated different sequences into classical music pieces, such as “Music Based on part of an Immunoglobulin Gene” (https://www.youtube.com/watch?v=9Q1EkWtff2I), and “A Song in Praise of Peptide Palindromes” (https://www.youtube.com/watch?v=0RNLG-ol75Q). The next big technical progress in translating DNA sequences into music was accomplished by David Deamer, a chemist/biochemist, who, similarly to Hayashi and Munakata, initially decided to allocated notes to the different nucleotides: A translated to the musical note ‘A’, C to ‘C’, G to ‘G’, and T to ‘E’. He expressed the 300 nucleotides sequence of an ALU element in the human genome (ALU elements are a family of nucleotide sequences that represent approximately 10 % of the human genome) into an electronic melody. Alongside other songs, the ALU gene song was released on the album “DNA Music / DNA Suite” (excerpts can be found at https://store.cdbaby.com/cd/drdaviddeamer). This initial work was followed by an ingenious and less arbitrary method than just assigning notes to nucleotides. Deamer utilised the light absorption of the four nucleotide bases to translate DNA into music. He measured the absorption of infrared light of different wavelengths by the nucleotides with a spectrophotometer and then translated the spectra into a band of frequencies that fall into the range of human hearing (in Hertz). The data was then converted into musical tones with a synthesiser, where light with a higher wavelength translated to a higher note (6). On this basis, Deamer and the composer Susan Alexjander released the album “Sequencia” with a nice mix of Western and Indian classical music (excerpts can be found at https://store.cdbaby.com/cd/salexjander and https://www.youtube.com/watch?v=VYjmKfsBcPc). Alongside the translation of DNA sequences, the proteins encoded by DNA have also been translated into music. John Dunn and Dr Marry Anne Clark created music according the amino acid characteristics of the protein, where musical parameters were assigned to the different molecular weights, molecular volumes and biochemical categories of amino acids (i.e. hydrophobic amino acids were assigned a lower pitch than hydrophilic ones for example). 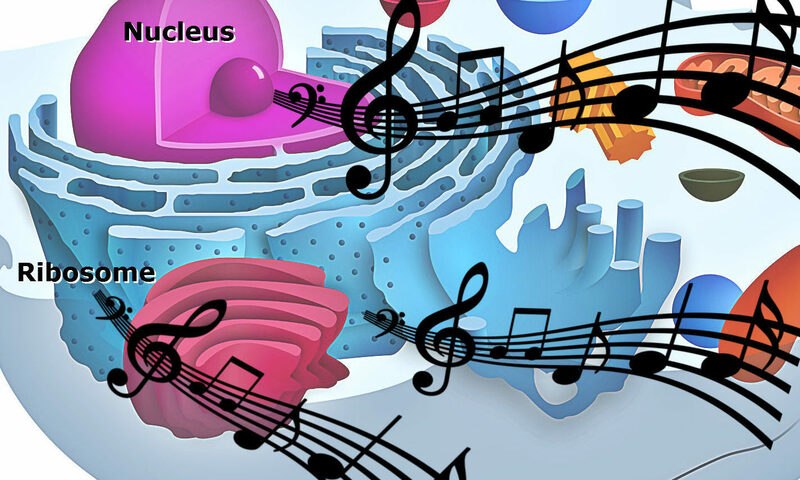 The secondary structure of the proteins also shaped the music (i.e. α-helices and β-sheets). The team translated the beta-globin (part of the human haemoglobin) and lysozyme C (an enzyme that is part of the immune system) sequences, amongst others, into electronic music with the occasional hint of classical music, and featured them on the album titled “Life Music: Improvisation on Genetic Themes” (songs can be found at whozoo.org/mac/Music/CD.htm), as well as on John Dunn’s homepage (http://algoart.com). This translation does not only have artistic value but was also used to detect differences or rather similarities of orthologous proteins in different species, as it was done for human haemoglobin and the globin of Tuatara species (reptiles) (orthologous proteins means that proteins in different species share a common ancestral genetic basis but diverged during evolution; however, they retained the same function (8)). The musical similarities in addition to the actual written sequence similarities of both proteins indicate that humans and Tuatara could have had a common ancestor (7). Linda Long, founder of Molecular Music (www.molecularmusic.com), went a slightly different technical route and translated proteins from herbs and medical plants, as well as human hormones such as the thyroid hormone (which is also a protein) into music according to their secondary structure that she determined by X-ray crystallography. Important parameters were again α-helices and β-sheets that were translated to arpeggios and a series of similar notes, so Long. The songs could be described as relaxing electronic and classical music (excerpts can be found on her homepage). Several other scientists and artists have since contributed to this field, such as Stuart Mitchell, founder of Your DNA Song Ltd (www.yourdnasong.com), who offers a unique service. Based on personal DNA sequencing data that is done by “23 and Me” for instance, they compose individual music in genres like classical music, Jazz, Rock, as well as contemporary music such as Techno and Hip Hop. An interesting web-based tool to make you own music based on the secondary structure of proteins was developed by Ram Samudrala and is called “Proteomusic”. It can be found at the Protinfo web server, including instructions on how to use it (http://protinfo.compbio.buffalo.edu/proteomusic/). Samudrala even released songs himself, where he presents his idea of the sound of protein translation (production of proteins according to RNA) for instance. It is difficult to describe the music genre, but his songs certainly have elements of electronic and rock music. 1. Schulkin, J., & Raglan, G. B. (2014) The evolution of music and human social capability. Frontiers in Neuroscience, 8, 292. 2. Hayashi, K, Munakata, N. (1984) Basically musical. Nature 310(5973):96. 3. Ohno, S., Ohno, M. (1986) The all pervasive principle of repetitious recurrence governs not only coding sequence construction but also human endeavor in musical composition. Immunogenetics 24(2):71-8. 4. Ohno, S. (1988) On periodicities governing the construction of genes and proteins. Anim Genet. 19(4):305-16. 5. Ohno, S. (1987) Repetition as the Essence of Life on this Earth: Music and Genes. In: Neth R., Gallo R.C., Greaves M.F., Kabisch H. (eds) Modern Trends in Human Leukemia VII. Haematology and Blood Transfusion / Hämatologie und Bluttransfusion, vol 31. pp: 511-9. Springer, Berlin, Heidelberg. 6. Alexjander, S., Deamer, D. (1999) The infrared frequencies of DNA bases: science and art. IEEE Eng Med Biol Mag. 18(2):74-9. 7. Dunn, J. and Clark, M.A. (2004) Life Music: The Sonification of Proteins. [online] Available at: https://www.leonardo.info/isast/articles/lifemusic.html [Accessed 26.10.2017]. 8. Fitch, W.M. (1970) Distinguishing homologous from analogous proteins. Systematic Zoology 19 (2): 99–113.